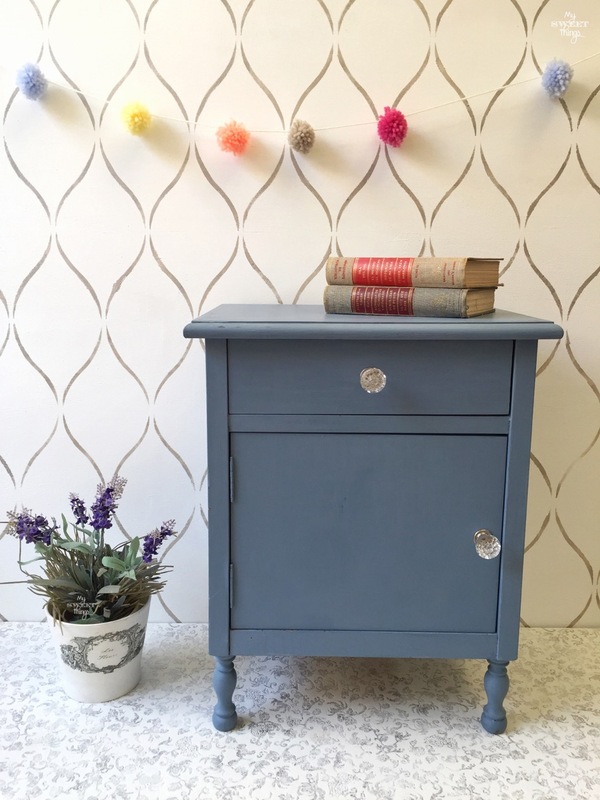 Today I can proudly declare the old bedside table I found more than two years ago has had a makeover, yay!! I never said I’m fast, did I? 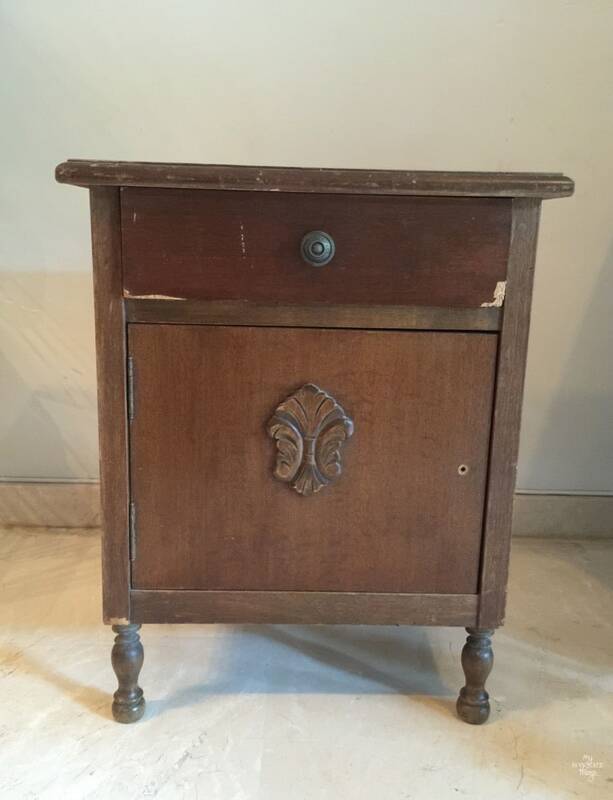 And in fact I didn’t makeover this old bedside table by myself alone, but let me explain the whole story. I found this little cutie next to a dumpster, it seemed she was waiting for me so I grabbed it and run. 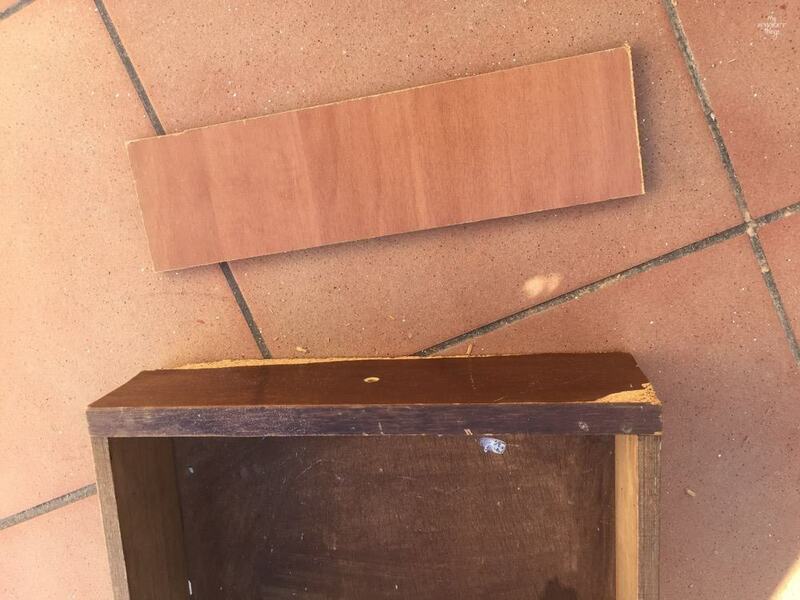 The front of the drawer was seriously damaged and it had some hardware missing. Not to talk about the top, it was a real mess! So it waited patiently some free time and inspiration for its makeover, it even survived a move. 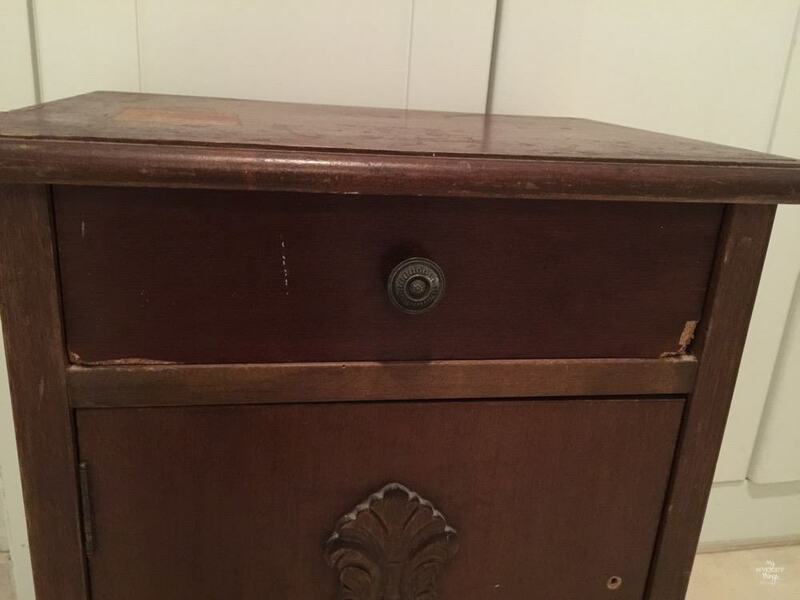 Then some weeks ago working on my oldest daughter bedroom makeover she told me she would like the old bedside table for her room. 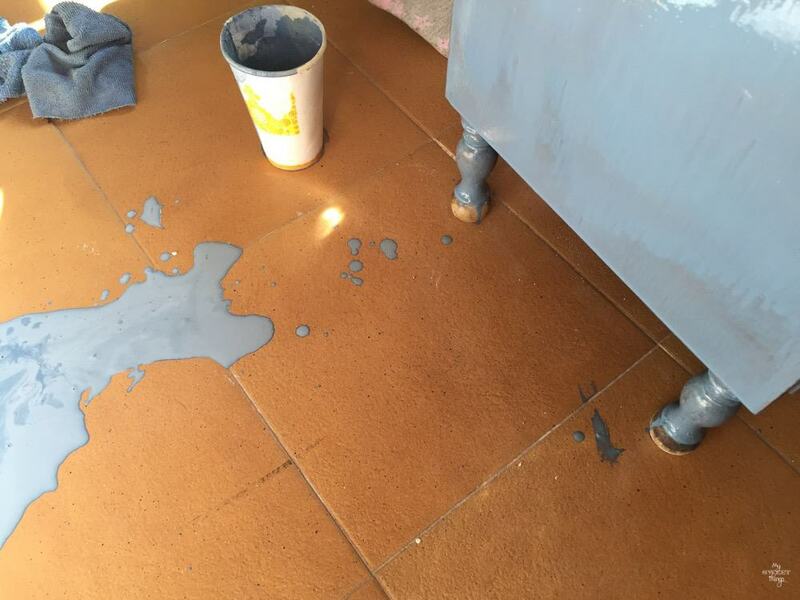 She knew I was quite busy so she offered to paint it herself. Guess my response: of course! We reached an agreement, I would fix the drawer and she would do the rest. The first thing was to get rid of the molding on the door, add some wood filling and sand it to make it smooth. 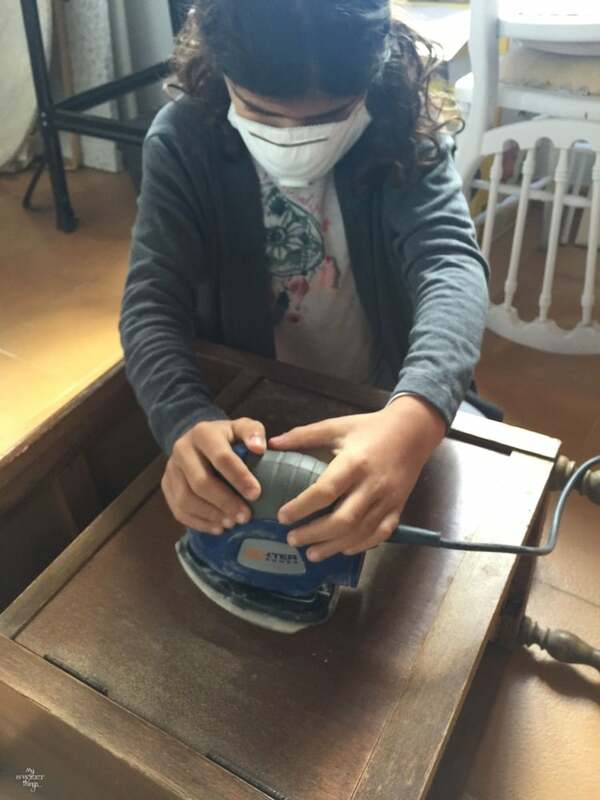 Safety is important, so she was wearing a mask during all the process of sanding. 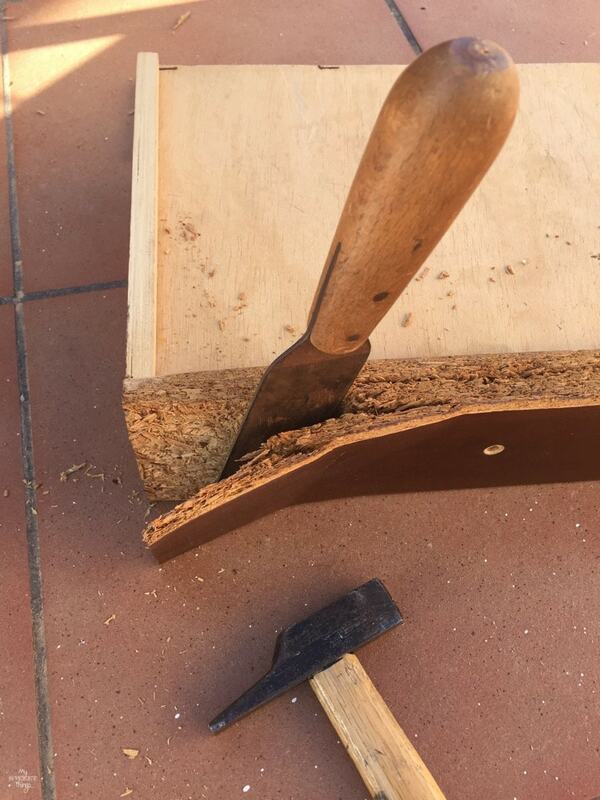 Then I used a chisel to take off the damaged wood so I could glue the new one instead. I used white glue and let it dry for 24 hours. 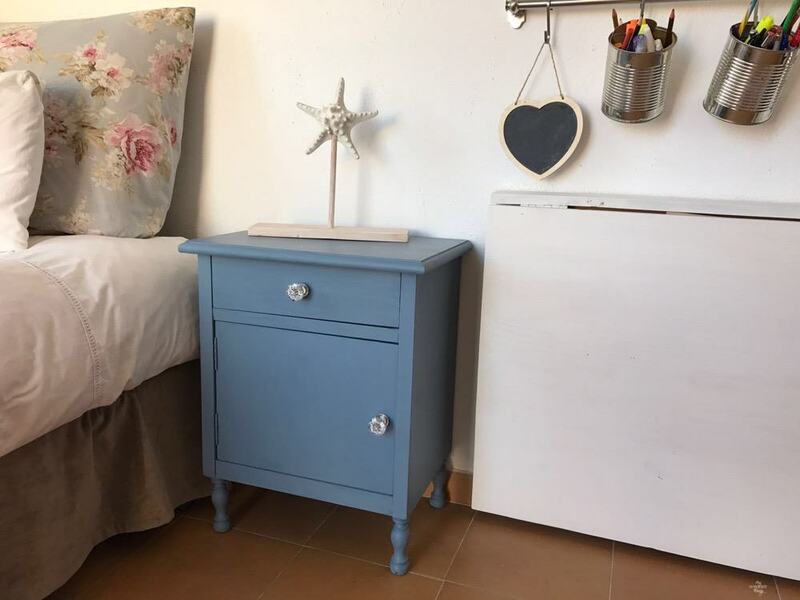 Miss A removed the hinges from the door to make it easier to paint the bedside table inside and outside. Now it was time to paint. Being my daughter the one that was going to be dealing with it, I wanted to be sure she was safe and I had the perfect paint. 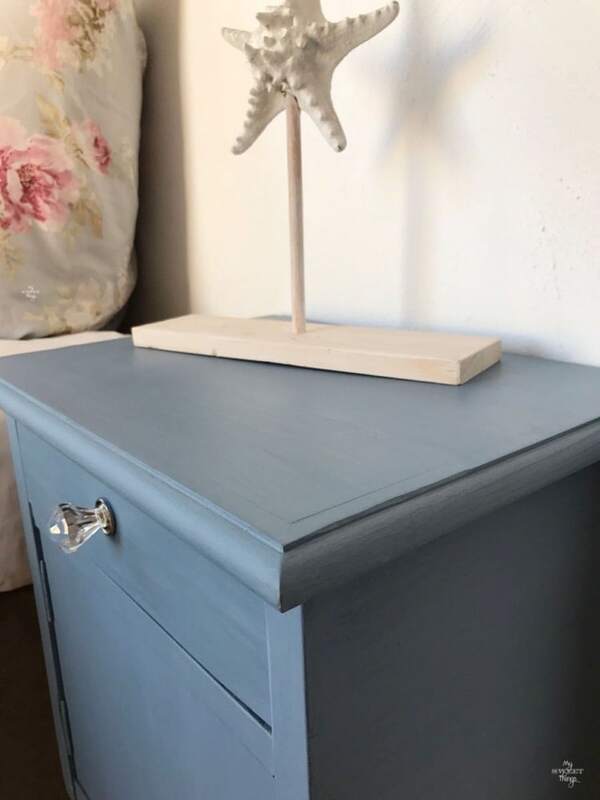 The Old Fashioned Milk Paint provided the paint for this project but all opinions are 100% mine and only mine, I really love this paint. In fact, it is a green paint free of VOC, solvents, lead, mercury and many other harmful stuff so I was confident she was safe. 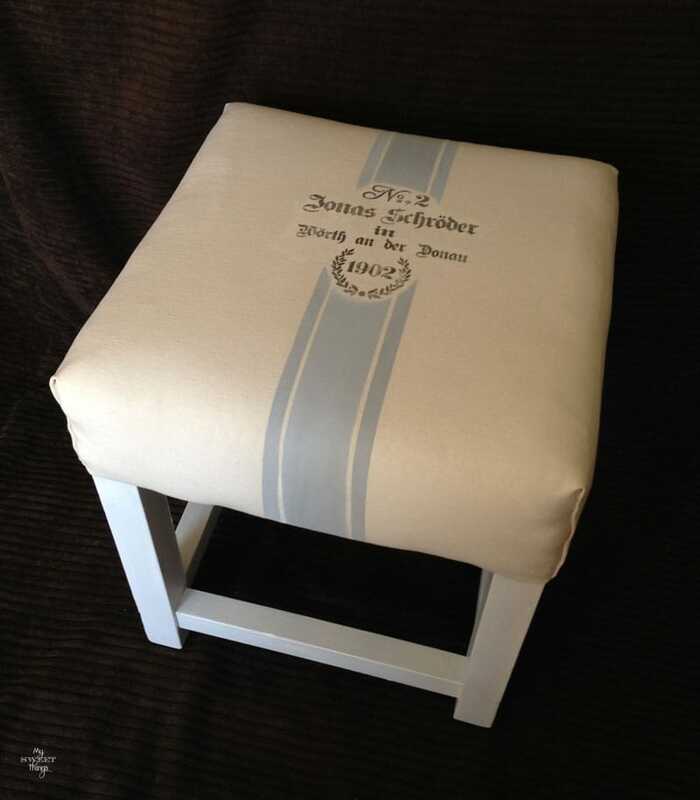 She wanted the same color I used on a sign I made recently and we mixed Soldier Blue and just a bit of Oyster White. 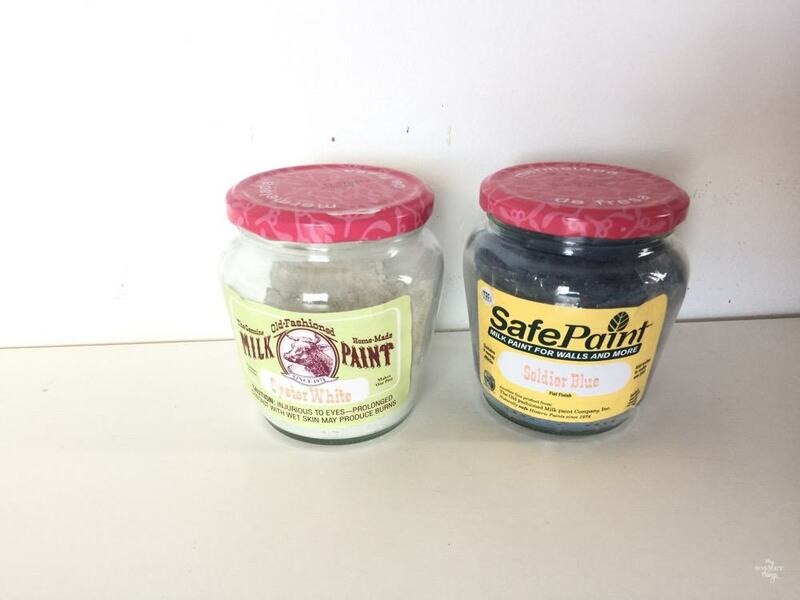 The difference between Safe Paint and Milk Paint is that the first one can be used on non-porous surfaces without chipping, while the second one will need some Extra Bond to help it adhere (unless you want it to chip). 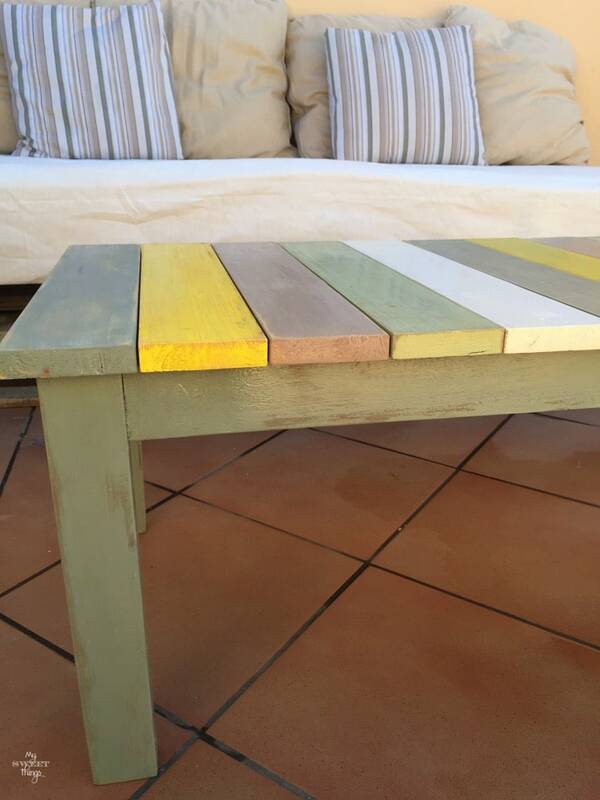 Milk paint comes in form of powder and you only need to mix it with the same amount of warm water and stir. Then just let it sit for about 15 minutes until the air bubbles disappear. Except she didn’t remember the cup was on the floor and hit it with the foot. Of course, I omitted the “I told you it wasn’t the best place for it”, now she knows. 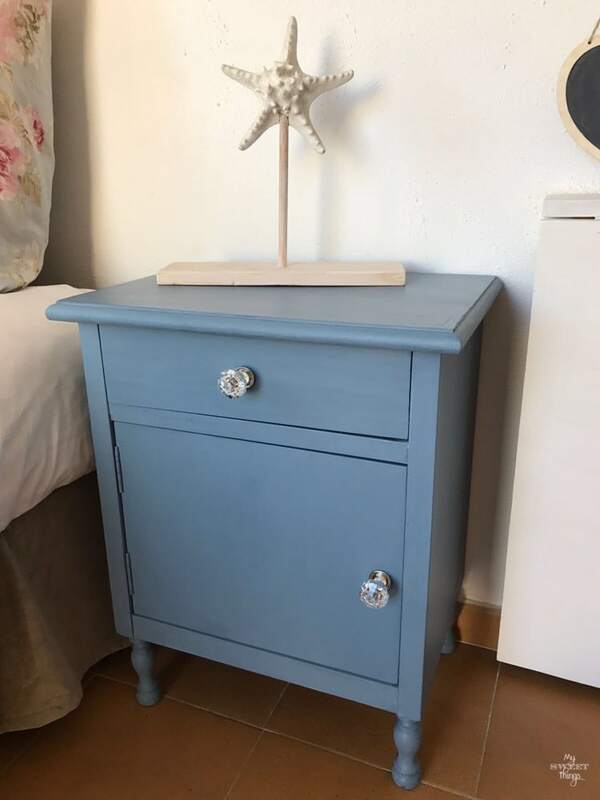 She prepared some more paint and gave the old bedside table two coats. Once it dried she applied two coats of Acryglaze to protect it. 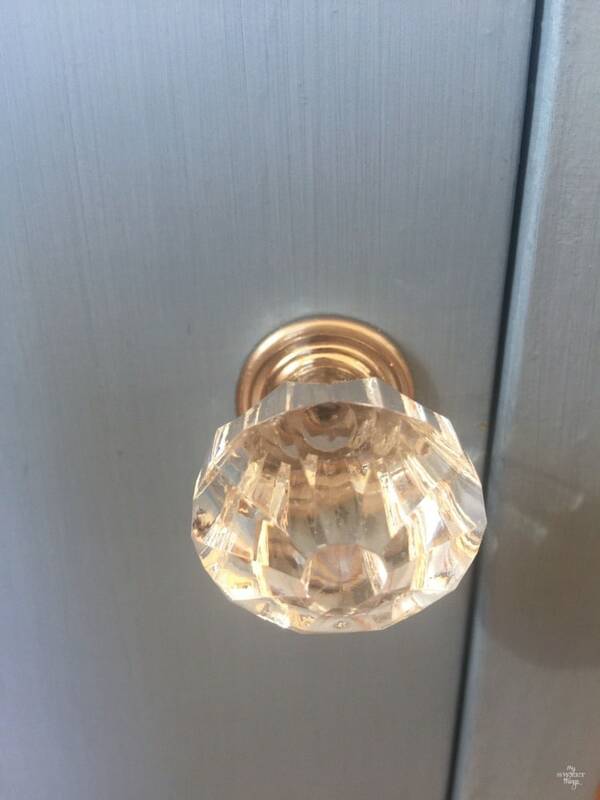 Then we added this beautiful crystal knobs from a local hardware store. I found similar ones here. It was done and she is so proud of it!! I am also proud of it and how beautiful it looks now. It’s part of her tiny bedroom and I hope I will be able to share the room makeover soon too. This paint is amazing, the picture doesn’t do justice but it is so smooth. 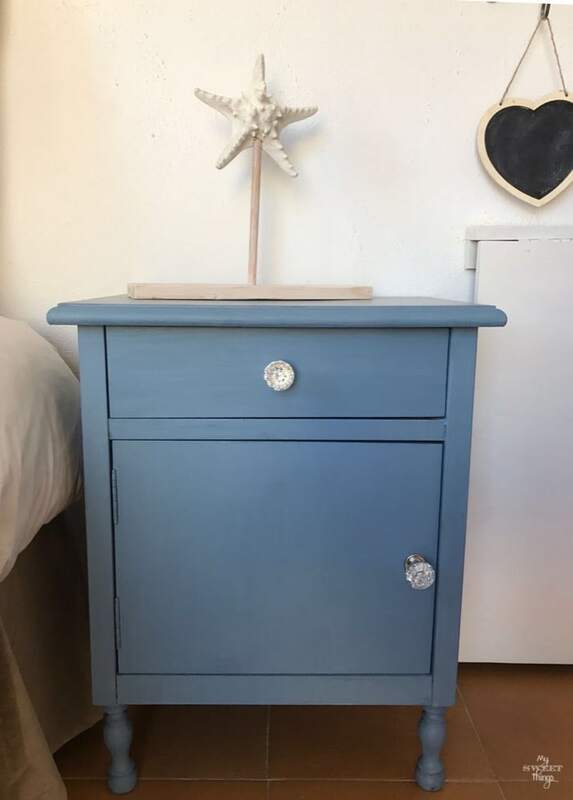 I’m happy she decided to choose blue for it, I don’t paint furniture in those color but now I’m thankful she did it because I’m in love with it. Here’s a picture of it on all its glory. 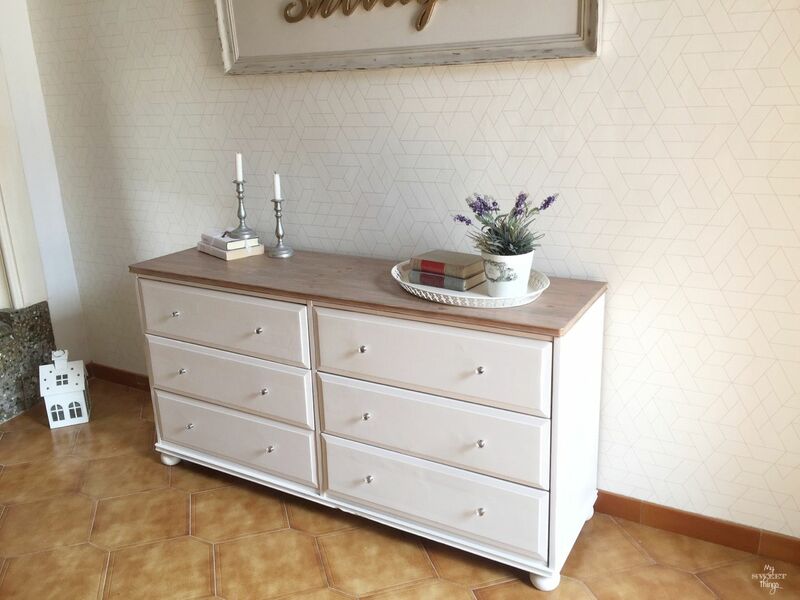 The wall on the back was painted using a gorgeous stencil, this Serenity Allover Stencil. I hope you enjoyed this makeover and don’t be afraid to experiment with different colors, it is totally worth it. What about you? What colors are your favorites? 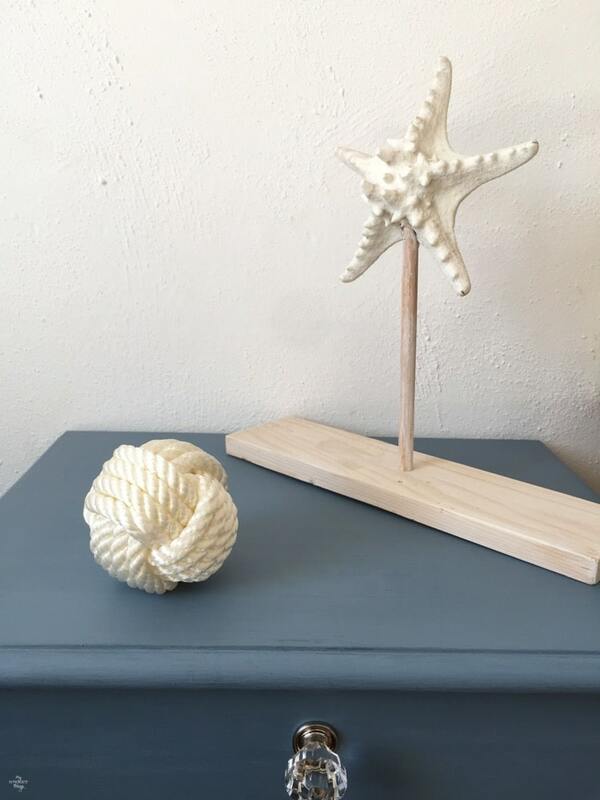 This entry was posted in Before & After and tagged Bedside Table, Before & After, DIY, Furniture, Milk Paint, Paint, wood. 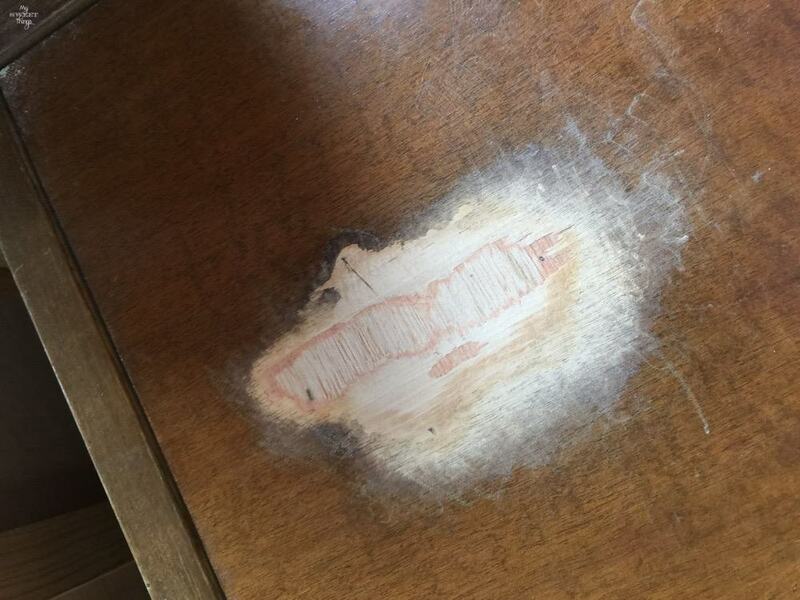 Miss A did a lovely job on the nightstand. The color is perfect. Thanks Debra, I agree. She is thinking about selling it to buy more stuff to refinish, love her to pieces. 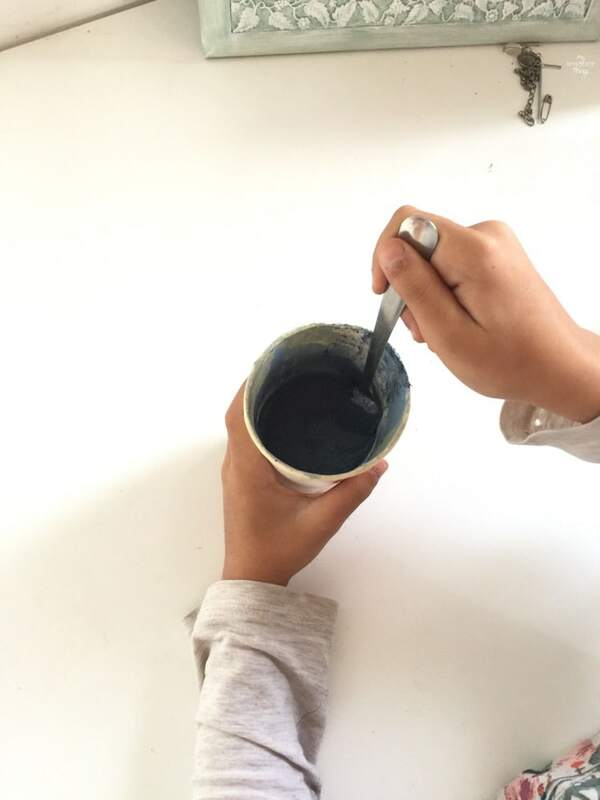 I don’t know why some people are a bit hesitant to try Milk Paint for the first time, this is a great example of how easy it really is, so simple that a child can do it, hopefully this tutorial will help those few get over their fear and dive right in. Little Miss A did a fabulous job for her first makeover by the way! I agree Brenda, I’ve thought about it too. Maybe because they need to mix it with water and they may think they can ruin it… but as you say any child can do it. Thanks for the compliments, I also think she did a wonderful job! Looks like she’s taken notice of what and how her Mom does, great job Miss A. She should be quite proud of job she did. Looks very cute in her room., saw it in Joann’s not long ago. Milk paint is getting good rep again, one of commercial craft manufacturers is making it again. 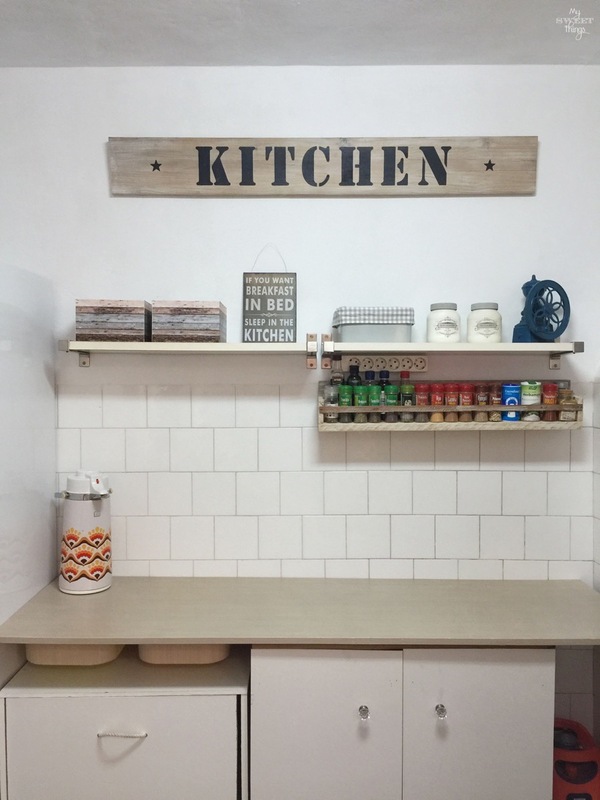 Would like to try milk paint you used but is way over my budget. She is most of the time by my side looking at what I am doing so of course she takes good notice, and she has her own wonderful ideas too. 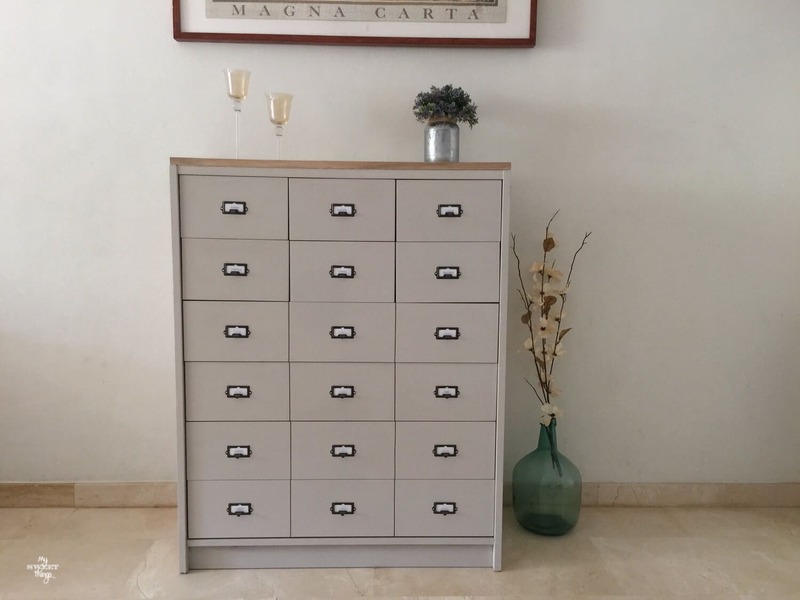 The good thing about milk paint is that it goes a really long way. If I remember well (despite the spill) she used 4 TBSP of the powder to paint everything. As you mix it with the same amount of water it doubles quantity and last longer. You left me thinking about what you said of Joann’s, what did you see there? Wow Pili, you’ve got a mini Pili right there. Miss A did an amazing job making over the bedside table. The color she chose is so pretty and it looks stunning with the new crystal knobs. I can’t wait to see what her room looks like when you’re all done. 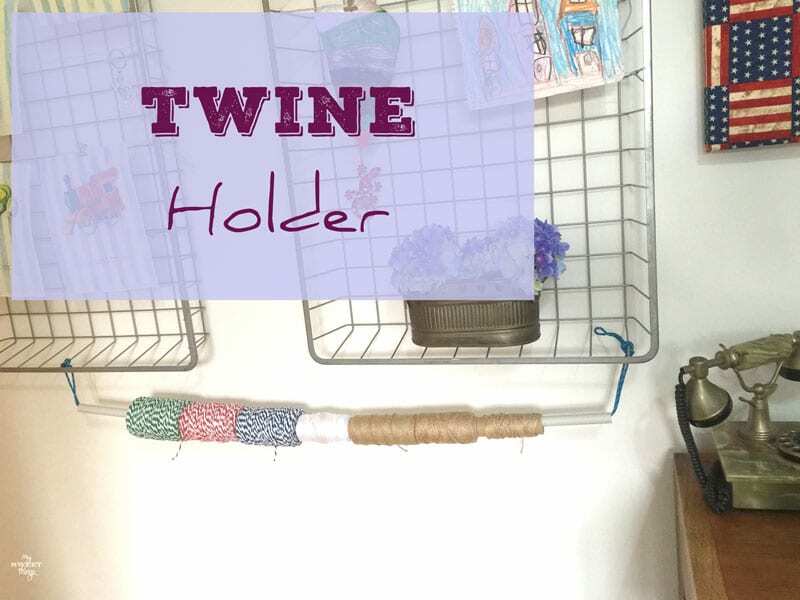 Thanks Michelle, she is super creative and like to make little things and crafts. 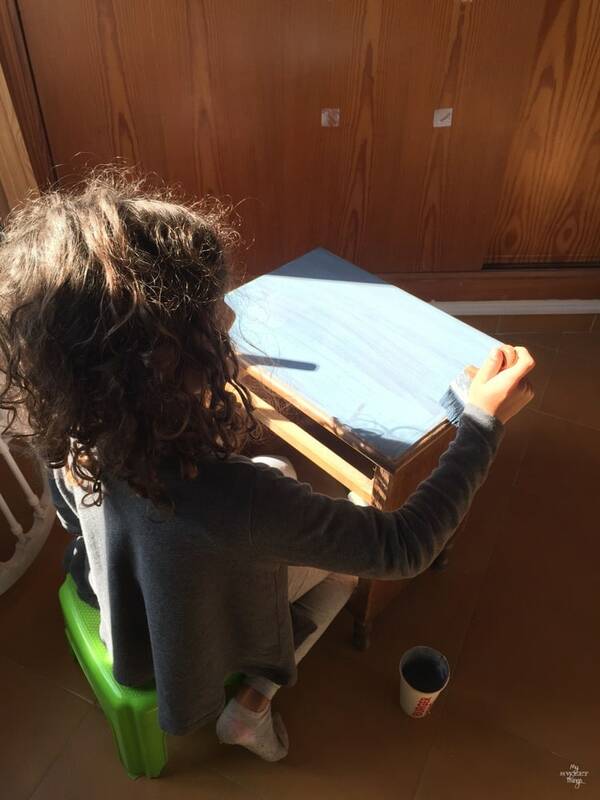 Wait until you see the miniature furniture out of cardboard she is making for her Lego toys. Of course! Both of them asked me for a section on the blog, so I’m working on it. I hope to be able to share it soon. Aww this is such a pretty table. Miss A is fabulous! She is following in her mom’s footsteps. I am glad you showed us how it is done Pili, and so important that even a child can do it. I love this color that you created. Of course I am going through a blue phase myself. Doesn’t it remind you of the sea? Many thanks, Mary. She is gaining confidence and tries different projects. She also hates sanding but understand is part of the process to get a good result. I like to see her ideas which some are complete different of mine, so great to see the diversity! I am also on a blue phace right now, I can feel the summer. How fun, Miss A did a super job!! Fabuloso!! The side table is really cute and I’m sure she’s is so proud of it!! 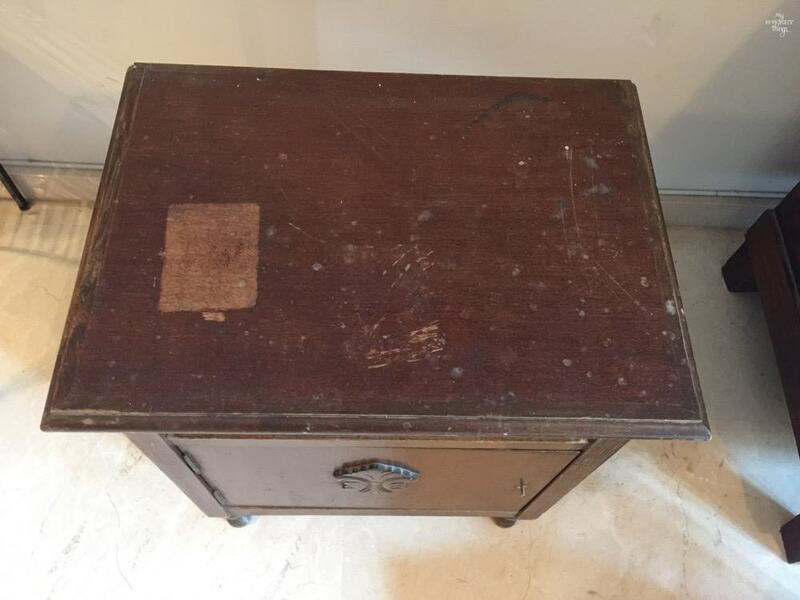 My girls love to help out or prep but haven’t had the chance to have their own makeover yet, I’m sure they’d love a side table like this one too. That colour is really beautiful too! Pili, this looks so beautiful!! Your Miss A and you did a wonderful job on this piece! 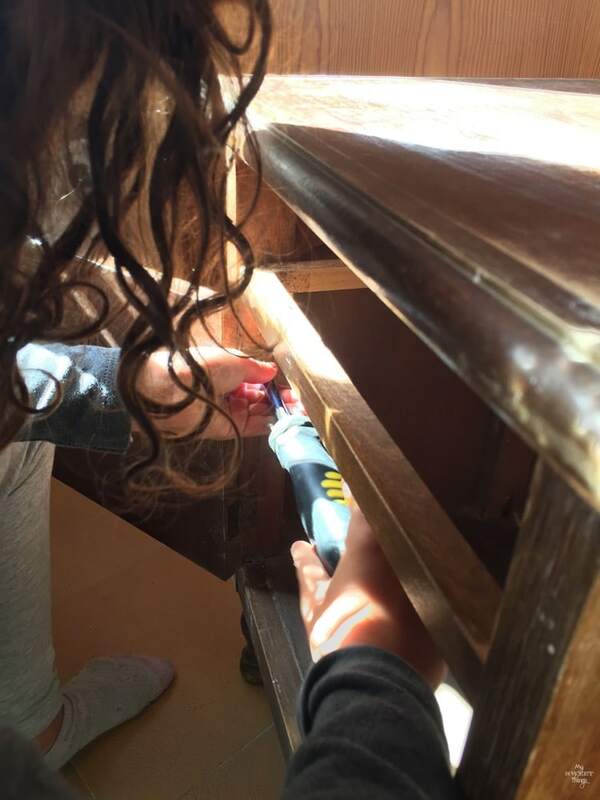 So glad that your daughter is interested in refinishing furniture like her mama. The glass knobs are an elegant touch to the table. Beautiful job!! !